For several years the Friends of Mount Field have harboured the ambition of reopening access to Beatties Tarn. The original track was very badly located and simply went the shortest route, including a substantial portion through a very wet sphagnum flat through which the tarn outflow spread. The park management plan suggests a re-route of the Beatties Tarn side track and rehabilitate the old track. 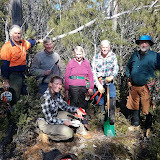 A suitable route close to the old was marked out with PWS staff and is about 320 metres of track of which 80 metres is the existing but overgrown track and the remainder is rerouted but close to the former track. We also had more impetus with the centenary of Mount Field National Park occurring in 2016, as it seemed a nice idea for the group to provide tours to Beatties Tarn as a contribution to the celebration. None of us thought that the 320 metres of track could be cleared in one session, but this is what was achieved. One part of the reroute crosses rocks and many have been moved about to make walking easier. The track now passes through a flat area of very nice bush to reach a short boulder field where the rocks have been manoeuvred to allow relatively easy passage. It then drops down to bush again before veering west through some tall old tea tree to meet the original track just below a short boulder climb. It is then along a dry level section to reach Beatties Tarn at a very pleasant spot beside the water with a good vista. It takes about 10 minutes from the main track which in turn is about 20 minutes from the Lake Dobson Road. Although the track is now open for use we plan to return shortly to finish off the boulder section plus work on those on the retained part of the track. There is also a short wet area at the very start at the junction with the Lake Nicholls track to harden. We really like the beautiful and tranquil Beatties Tarn. More details on the Beatties Tarn project is at this site. The Friends of Mt Field have a web Site that provides details of future working bees and links to our activities. You can also sign up for our newsletter.